It’d be hard to chalk up The Gamits’ recent reunion to nothing more than opportunism and keep a straight face. The Denver band’s returning to a pop-punk world that’s a mere shell of the one it left in 2005, and where album sales are dipping to new lows with each passing year. 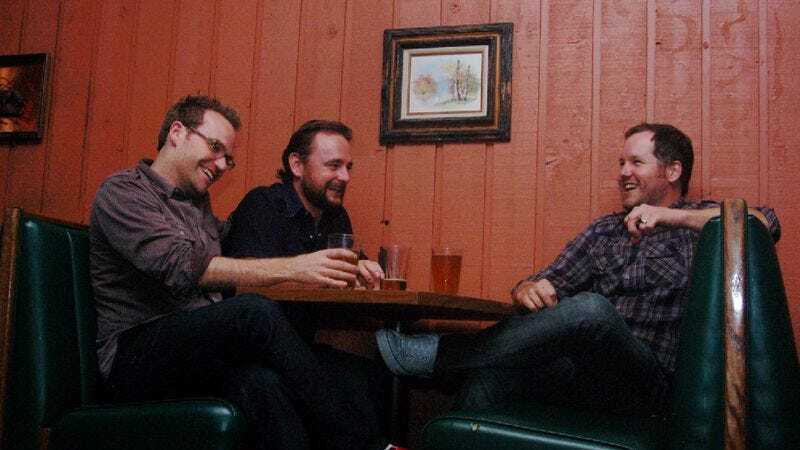 Despite that, the trio’s regrouped after a five-year hiatus for Parts, to be released jointly in the fall by Suburban Home Records and Paper + Plastick. Before they make their return to new-release sections, The Gamits get the reunion going in full bloom with their official comeback show this Friday at the Bluebird Theater. Singer-guitarist Chris Fogal took a break from putting the finishing touches on Parts to chat with The A.V. Club about reuniting in such an inhospitable environment. The A.V. Club: Since announcing the reunion, you’ve received a lot of national attention. Does it make you wish you’d stuck it out through all those years? Chris Fogal: No, not really. I think that not doing the band for however long it’s been has been the right decision and this album wouldn’t have happened otherwise. Everything worked out the way it did because it did. If we hadn’t taken those five years off, we’d have been doomed. AVC: Is it an inevitable part of any band’s career to take time off and decompress from all the stresses of being a band? CF: It’s not like we can do it as a full-time job and make a living. If you have life, a family, you have to be realistic. It takes a lot of time to make rock albums and tour and all that stuff. I think it gets harder for bands all the time. It was getting harder when we were still touring a lot. That’s when CD sales plummeted and everyone started pirating. Gas prices went up. Now, I can’t even imagine getting in a van and doing a DIY tour across the country. It sounds miserable to me. AVC: Do you think fans need to wrap their head around the fact that bands just can’t tour like they used to when album sales aren’t there? CF: I feel like you don’t want to pay more than $10 for a show or whatever, but you steal your entire record collection off the Internet. People, especially kids, think that music is free, because it is. They’ve just learned that. I wish something would turn that around so that smaller bands would have it a little easier when they go out on tour. AVC: With this reunion, instead of going the usual route and touring on old songs, you wrote a new album. Was that important for the band in this reunion? CF: It was huge. When we started talking about doing a reunion, we just wanted to go back to Japan and play some shows. [But] I didn’t want to go back and be a parody of our band, and just play the old hits or whatever. I was like, “I’d love to go back, but let’s make an album instead and do it right.” I’m so glad that we did. It’s been a super-positive experience. AVC: You’ve said Parts isn’t going to sound much like Antidote. Is that a natural progression, or are you just not too happy with how Antidote turned out? AVC: Are The Gamits going to be an ongoing band again or is this just a short-term reunion? CF: I’m kind of hoping it might go for a while this time. We’re all super-positive about it. That’s easy to say right now because the album’s about to come out and everything’s cool right now. But we’re real good friends, the three of us in the lineup now. It’s just been so positive and hanging out has been so fun. And the songs? I really enjoy the songs.